Ajay Mathur M.D., F.A.C.P., will be recognized with the Sickman-Levin Award for Dimensions in Medicine at Monongahela Valley Hospital's Gala 31, "A Roaring Good Time," on Saturday, May 18 for the high level of care he provides to patients and his leadership in the Hospital. 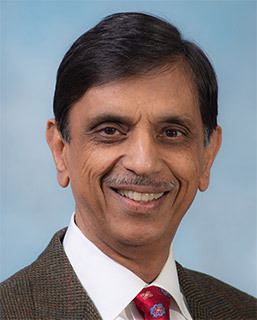 On Saturday, May 18, at Gala 31, Monongahela Valley Hospital will recognize Ajay Mathur M.D., F.A.C.P., with the Sickman-Levin Award for Dimensions in Medicine for the high level of care he provides to patients and his leadership to Monongahela Valley Hospital (MVH). From his earliest days at the Hospital, Dr. Mathur raised awareness of problems related to arthritis and related diseases. He conducted ongoing programs on various topics related to arthritis and introduced arthritis and fibromyalgia support groups. His medical staff leadership in the area of education is multifaceted. As chairman of the Library and Education Committee, he steers and maintains a vibrant continuing medical education program to keep the Hospital staff informed of the latest medical developments. MVH has been privileged to have Dr. Mathur on staff for the last 29 years. The Sickman-Levin Award was created to honor two physicians, Albert S. Sickman and Herbert J. Levin, for their many outstanding contributions to health care in the mid-Monongahela Valley. Gala 31, themed "A Roaring Good Time," is the Hospital's annual black-tie fundraiser. Each year exemplary individuals are celebrated for their commitment to excellence with the Dimensions in Performance Awards. These awards honor the multi-dimensional talents of special friends, benefactors and members of the health care family who have distinguished themselves in the areas of philanthropy, medicine, volunteerism and civic well-being. For more information on Gala 31, contact Melissa Marion, director, The Monongahela Valley Hospital Foundation, at 724-258-1855.